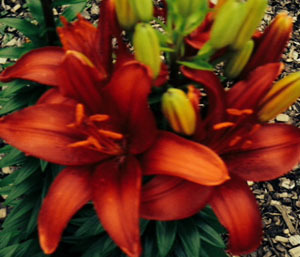 The lilies bloomed late this year, but bloom they did. Sometimes we’re in full bloom on time. Other times, we are folded up tight in retreat, waiting for the blooming process to ensue. Sometimes we lead, sometimes we follow. Perfection tells us it’s all or nothing, providing an excuse to hesitate or stop completely. Don’t. Keep moving, even in waiting. There’s a lot of “in between” time when we are amidst growth, being transformed into something new, unfamiliar and beautiful. The blooming process unfolds in its own time, for its own purpose. Light waits patiently for us, steady and unwavering. We may bloom late, but it’s never too late to bloom, again and again. Blooming time is right around the corner, cultivated with patience, time, hope and persistence. So very true, Cast-Light……. God bless you and yours. Always there for you and you’re quite welcome…. I just give credit where credit is due. May the God of Abraham, Isaac and Jacob bless and keep you and yours always. Great background! Thanks for sharing.